The first time I tried tortilla strips was about 10 years ago. A co-worker of mine had made them to bring to a Christmas party. It was an insanely popular dish… I daresay, the most talked about dish at the party! Of course, I asked for the recipe, and was blown away at how incredibly simple it was. And luckily for you guys, I wasn’t sworn to secrecy to keep the recipe, so I am sharing it today! I went home and told my husband all about them, and replicated the recipe within a week. He was equally impressed, and thus, the recipe became a cherished one in our family recipe vault. This recipe can go savory or sweet, depending on your mood. If you are craving a sweet snack, you can toss it with sugar, cinnamon and nutmeg. If you’re craving salty appetizers, toss with salt, garlic, onion and chili. Or make a whole batch and toss ’em with half sweet blend, and half salty. Warm oil in a large pan over medium heat. Meanwhile, slice tortillas into 1/2″ thick strips. When the oil reaches 375 degrees, add tortilla strips and fry for 30 seconds a side, or until golden brown. Remove from heat, and place to a paper-towel lined bowl or plate. For the salty blend, sprinkle lightly over the strips while they’re still hot. 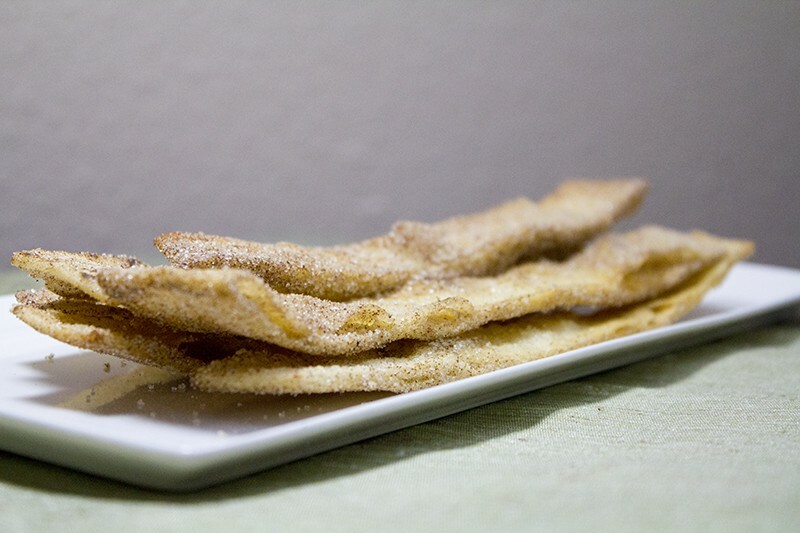 For the sugar blend, add sugar mix to a large plastic baggie and put in 6 warm tortilla strips. Seal the bag and shake until well coated. Repeat until all tortilla strips are covered. As you can tell, these are also wildly popular with toddlers. Sweet Elle couldn’t even wait for me to get finished taking pictures before she swiped one off the plate! 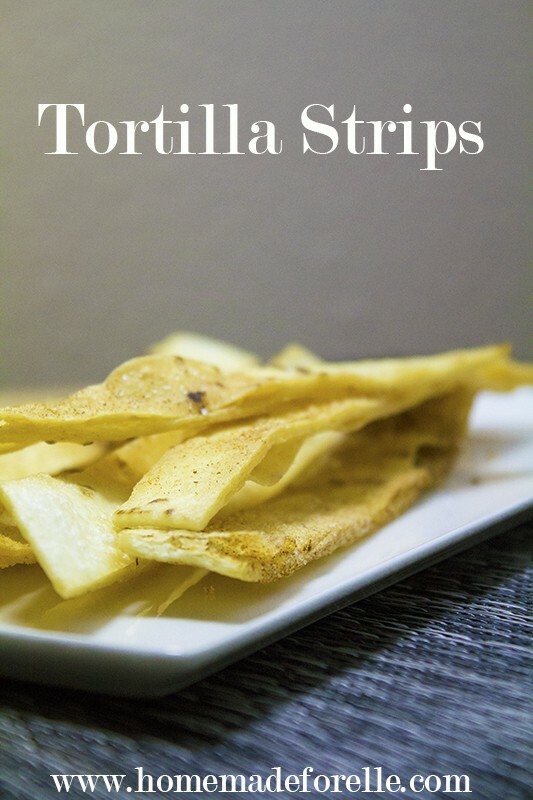 If you’re looking for the smaller tortilla strips to add ontop of salads and soups, here is a good baked recipe! 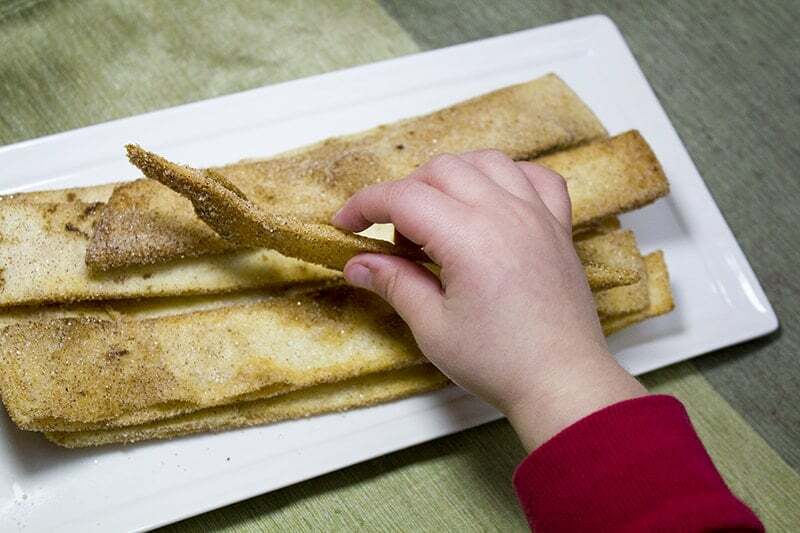 Do you want to try the salty or sweet tortilla strips? Or both?